At the risk of starting to turn into a Tesla blog, because there’s been so much positive news about the electric car company lately, here’s the latest. Tesla has announced that it will be pushing ahead with a massive North American expansion of its high-speed electric car charging network. Tesla has said that by the end of 2013, Superchargers will connect most of the major metro areas in the U.S. and Canada, and a year from now the Supercharger network will cover most of the population of the U.S. and Canada. That’s going to be some mighty fast deployment right there. And there’s little reason to doubt that it will happen as stated, because Tesla has been pretty good at keeping to its ambitious timelines so far. No doubt this reflects the breathtakingly ambitious nature of the company’s founder and CEO, Elon Musk (see Elon Musk aims for 80,000 person colony on Mars). Firstly, the amount of Supercharger stations is set to triple from the current 8 to 25 by June. These will cover more area in California and the Pacific northwest. Texas will get some attention on the route between Austin and Dallas. Colorado, Illinois, and the East Coast will also see networks developed. 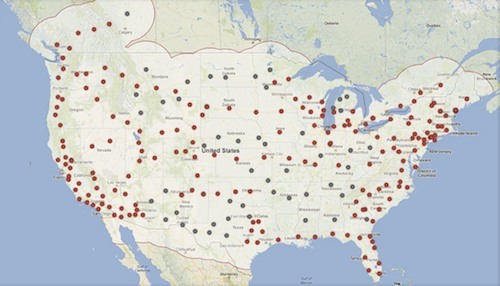 The above Supercharger Network map shows the expected coverage by 2015, and Musk has said that he thinks there will be even more stations by 2015 than the map currently shows. In case you were wondering, and I certainly was, Musk says he’s not against allowing other electric carmakers making their cars compatible with Tesla’s network. Because Tesla wanted to get on with the job of building a network and accelerating the uptake of electric cars, the company did not want to wait for come sort of slow consensus about charging technology and deployment. 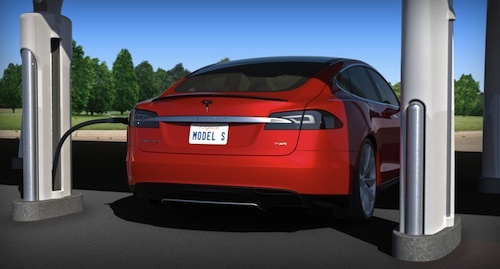 “We just need to get going and other manufacturers can either copy us or join us”, Musk said.